Modulation of CXCR4 and associated pathways may enhance HSC engraftment. (A) Summary of some findings of Gao et al. (2). Engraftment of WT (Cxcr4+/+), hemizygous (Cxcr4+/o), or WHIM (Cxcr4+/w) donor cells in either lethally irradiated Cxcr4+/+ mice or in unconditioned Cxcr4+/+ or Cxcr4+/w recipients. Hemizygous Cxcr4 cells have markedly increased engraftment compared with cells from WT or WHIM mice. (B) Several additional possibilities to enhance engraftment of HSCs in the context of WHIM and other nonmalignant or malignant disorders. 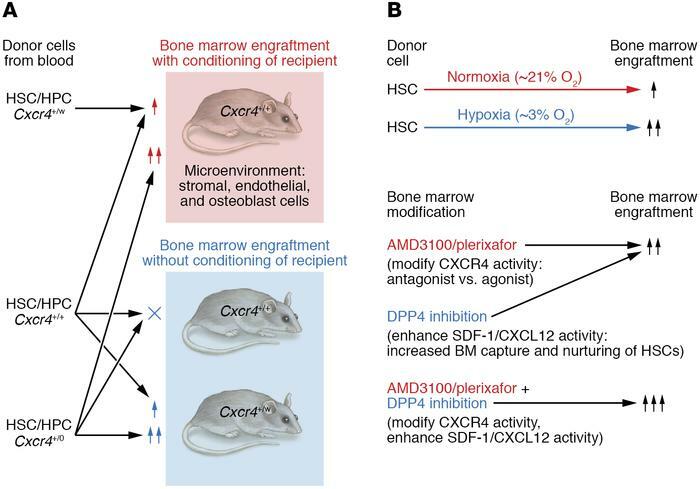 These include HSC collection under hypoxic conditions and strategies to modify CXCR4, CXC12, and DPP4 in the bone marrow microenvironment of recipients. ↑, denotes engraftment, ↑↑, greater engraftment, ↑↑↑, even greater engraftment, and X, no engraftment. Details are provided in the text of this commentary.